Arachnophobia is the fear of Spiders. This is one of the most common phobias in the world and also one of the oldest recorded. It is estimated that roughly one third of the entire world population is Arachnophobic! More women than men seem to suffer from Arachnophobia, but this could be because women are more willing to admit to the phobia and seek treatment. The response to spiders shown by an Arachnophobic individual may seem irrational to others and often to the sufferer himself. The origin of the word Arachnophobia is Greek, derived from the word ‘arachne’ which translates to spiders and 'phobos', means to dread or to fear. There is a Greek myth about a young woman named Arachne who challenged the Goddess Athena to a weaving contest. The end results with Arachne being turned into a spider by Athena. Spiders eat roughly the equivalent of the weight of the entire human population in insects EVERY SINGLE DAY. Just imagine a world without spiders, it's not one you actually want! The main cause for Arachnophobia is learned. Either from a parent, sibling, friend or other family member. It is also developed from having an experience with a spider that terrified the person at a young age. This could be as simple as walking into a spider's web or seeing a spider unexpectedly. For some people, it is a learned response: they learn to fear spiders after having seen others being fearful. The fear of spiders can be a family or cultural trait: many people in Africa are known to fear large spiders whereas in South Africa, where they eat spiders, most are unafraid. Traumatic experience in the past involving spiders is another reason for Arachnophobia. Many people see the fear of spiders as something innate. However, that can't be entirely true as we are only born with the fears of loud noises, Phonophobia, and the fear of falling, Basiphobia . However, there is evidence that the fear could also be part of evolutionary selection. Scientists have researched how the fear of spiders has evolved throughout history and from ancient times spiders have been linked to disease and infection. Some ancient cultures even blamed spiders for the bubonic plague! So, even though spiders do a lot of good for humans by eating vast quantities harmful insects, they have been seen unfairly as the bad guy for thousands of years. Scientists who have studied this fear of spiders explain it to be a result of evolutionary selection. This means that Arachnophobia is an evolutionary response, since spiders, especially the venomous ones, have always been associated with infections and disease. Hence, the fear of spiders triggers a “disgust response” in many individuals. A study conducted in the UK on 261 adults showed that nearly 32% women and 18% men in the group felt anxious, nervous or extremely frightened when confronted with a spider (real or images). ​Initial symptoms of Arachnophobia or the fear of spiders may appear in one’s childhood or adolescence. However, following a traumatic episode, some or all of the following symptoms may be present at all ages when the sufferer is confronted with the object of the phobia, in this case, a spider. ​In some Arachnophobic individuals, these symptoms may be triggered merely by anticipating contact with a spider. Even the sight or mention of cobwebs can trigger such a response. You can't avoid spiders, they are everywhere! So having a phobia like the fear of spiders is particularly bad. Spiders can appear anywhere and anytime, so this means you are subconsciously always under stress and tension. Many people with a fear of spiders miss out on important opportunities such as travelling to a foreign destinations for a holiday or to visit relatives. Others are trapped within or out of their own homes because of spiders showing up in certain spaces. A lot of people waste hours of every day just checking for spiders, while others face ridicule from friends, family and work colleagues if a spider shows up. For the serious arachnophobic, the ways a fear of spiders can limit and disrupt life is exhaustive! ​I am often able to help people break free of their phobia in just one session with the scientifically proven power of hypnotherapy, combined with NLP and an immersive therapy option. My therapy skillfully combines these techniques uniquely to create the most powerful, effective and quickest way to beat a phobia. You will be in the hands of a trained phobia expert who will help you transform your mind and liberate yourself from even the most extreme fears. Hypnotherapy is so effective with phobias because it tackles the underlying trigger of the phobia within the subconscious. Once a person has access to their subconscious they can eliminate their conditioned response to the stimulus. So instead of treating just the symptoms, hypnotherapy can heal the source for a lasting result. 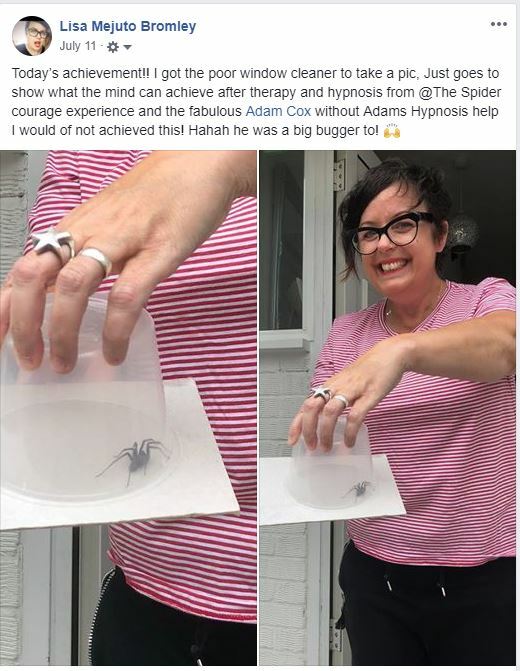 The best part about hypnotherapy and phobias is that often it only takes one session to completely get over the phobia, so you do not have to spend a lot of money on continual treatment. The NHS also promotes hypnotherapy as an effective treatment for phobias. For spider fears, I help run an incredibly powerful and effective group therapy workshop called 'The Spider Courage Experience.' We have had 100% success rate so far and have been featured on ITV. The group therapy aspect makes this treatment even more effective and better yet, really fun! To find out more, go to www.spidercourage.com and book your place today. No need to waste anymore time being afraid of spiders! A 40 minute download that will rewire your thought patterns to free you from your fear. This is recorded by Adam in a professional studio and is based on the 'fast phobia cure' or staged disassociation technique. This is the same technique Adam uses in his private practice and group workshops. This will be emailed to you within 24 hours of purchase.